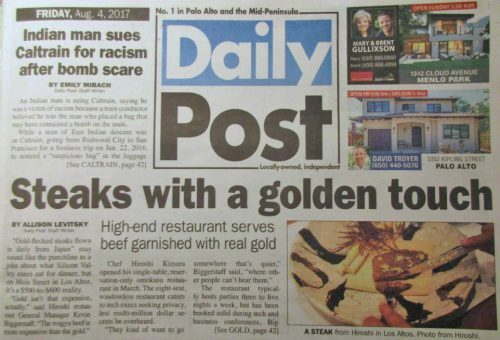 Gold-flecked steak in Silicon Valley – an indicator? News Item: Silicon Valley (Los Altos) wagyu beef omakase restaurant offering $150 sandwiches and a $600 steak sprinkled in gold leaf. (a) Silicon Valley is long on $$$, but short on sophistication. (b) The bubble is reaching its peak. Trade Your Troubles For A Bubble! Is your R&D messed up? Then call R&D Cleaners!